Garðaríki (anglicized Gardariki or Gardarike) or Garðaveldi is the Old Norse term used in medieval times for the states of Kievan Rus'. As the Varangians dealt mainly with Northern Rus' lands, their sagas regard the city of Holmsgardr (Holmgarðr, Veliky Novgorod) as the capital of Garðaríki. Other local towns mentioned in the sagas are Aldeigjuborg (Old Ladoga), Pallteskja (Polotsk), Smaleskja (Smolensk), Súrsdalar (Suzdal), Móramar (Murom), and Ráðstofa (Rostov). Three of the Varangian runestones, G 114, Sö 338, and U 209, refer to Scandinavian men who had been in Garðar. The meaning of the word Garðaríki is usually interpreted as garðr + ríki: "the kingdom of cities", or "the realm of towns", which probably referred to a chain of forts along the Volkhov River, starting with Lyubsha and Ladoga (see Evolution of the word Gord). These forts had to assert themselves especially against the Khazar Khaganate until the end of the 9th century and therefore they developed the first East Slavic state which is known as Kievan Rus'. Garðr contains the same root as Slavic gord ("town") and English garden. Garðr refers to a wall or fortification but came to primarily mean what it contained. For the Germanic etymology of the latter element, see the article on Reich and the archaic English term rike. Brandt, Dagmar: Gardariki. Ein Stufenbuch aus dem russischen Raum (novel). 2 Volumes, Berlin 1943. Reprint Faksimile Verlag Bremen 1981. ^ Pritsak, Omeljan (1981). 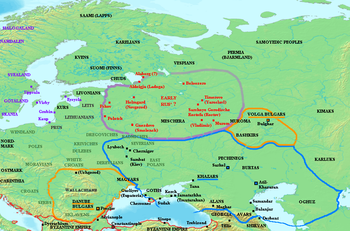 The Origin of Rus': Old Scandinavian Sources Other than the Sagas. Cambridge, Massachusetts: Harvard University Press. pp. 346, 396. ISBN 0-674-64465-4.